1. Take her on a day trip, surprise her with an overnight getaway! Make the weekend last a bit longer and sleep in a cozy suite right next to the bay. Take mom into town for a day trip and surprise her by checking into a hotel for the evening. This will be your gateway to relaxation, as you both can enjoy exploring town with a place to rest nearby. When you check into your hotel, you will receive a passport to savings at 11 amazing restaurants and stores in town. This will help guide you during your trip! Mother&apos;s Day is the best time to see newborn great blue herons at the heron rookery, right outside the entrance of the Morro Bay Museum of Natural History. It&apos;s common to see both males and females caring for their young, which typically hatch early in May. Be sure to look high in the tree boughs, as herons can have nests up to 100 feet off the ground. Pack your binoculars along to catch a better view. Stop by the Museum of Natural History and talk with one of our local experts for more information. Almost too cute to handle, our baby and mommy otters typically hang out toward the edge of the water next to Dockside restaurant and are seen all the way to Morro Rock&apos;s parking lot. They&apos;re often spotted cuddling with their mommies, eating some lunch or playing around in the water. You&apos;ll want to bring your camera! All the best sons and daughters want to treat mom on Mother’s Day. 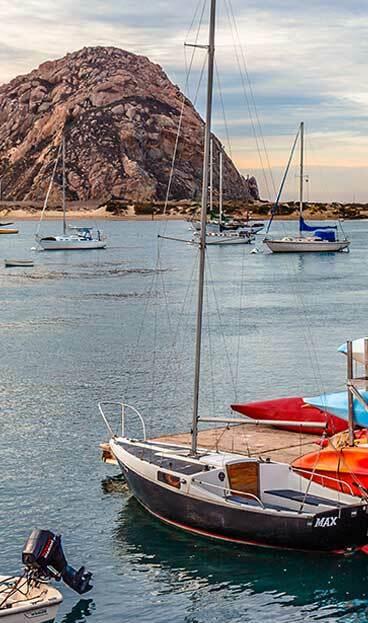 Morro Bay has several ways you can “wow” her this year through simple delicacies. Try out one of our family-owned bakeries or homemade candy stores to find the perfect treat for her. Or, skip the sugar and enjoy a spa day together. There are many spas and salons near the waterfront to find serenity. Whether she likes pedicures, facials or massages, all are options to those who book early.